Webinarjam Reviews Plus Exclusive Trial Pricing for 2019? Wondering if Webinarjam is for you? Then read our full review and see the demo below. Or if you're ready to join and looking for the special discount code for the 60 Day trial pricing, then click here. 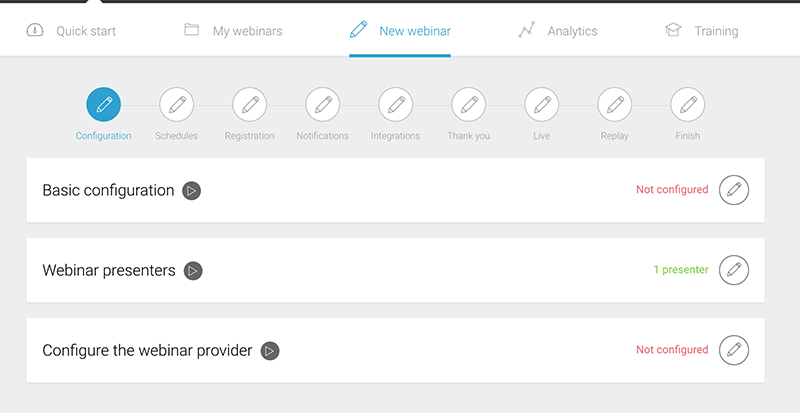 Why Should You Use Webinars? If you're throwing around the idea of adding webinar marketing to your digital efforts, then I'd encourage you to stop thinking and immediately begin implementing this strategy. There's no other strategy that allows you to broadcast your message in real time to anyone around the world. Using webinars, instead of speaking to just 1 customer, you've got the ability to be in front of hundreds, even thousands of potential customers. You can do this without leaving your home. Webinarjam is a web based software that allows you to create webinars without having to know techie code, complex scripts, or without spending a fortune. It's simple using their step by step wizard as you'll see in just a moment in the demo of the software. Unlike many of the other reviews you'll see, we've actually tested and demoed the software as you'll see below. Ready to join use and begin using webinars? Go here to activate your 60 Day Trial. When you open up the dashboard, it's incredibly simple to navigate. The basic option is good if you're doing a quick meetup with a client or if you're needing to set something up fast. For what we'l be walking through is the more complete, Full Integration because this is what you'll be using in most scenarios. 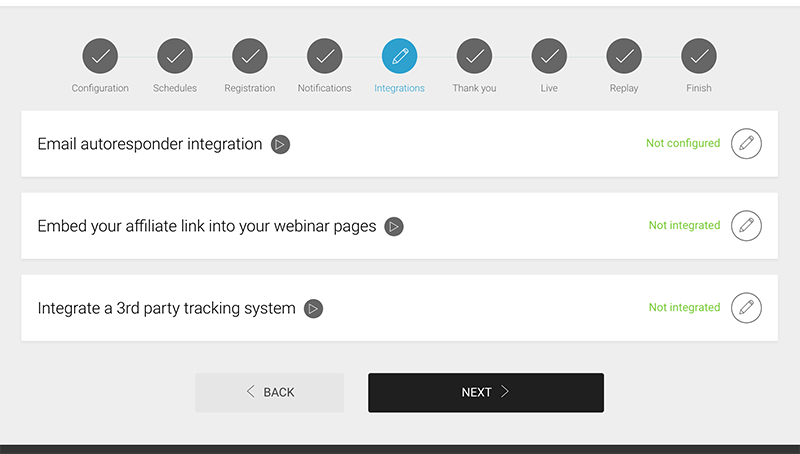 As you'll see in the above image, the first step is to configure your webinar settings with your presenter and the webinar provider. 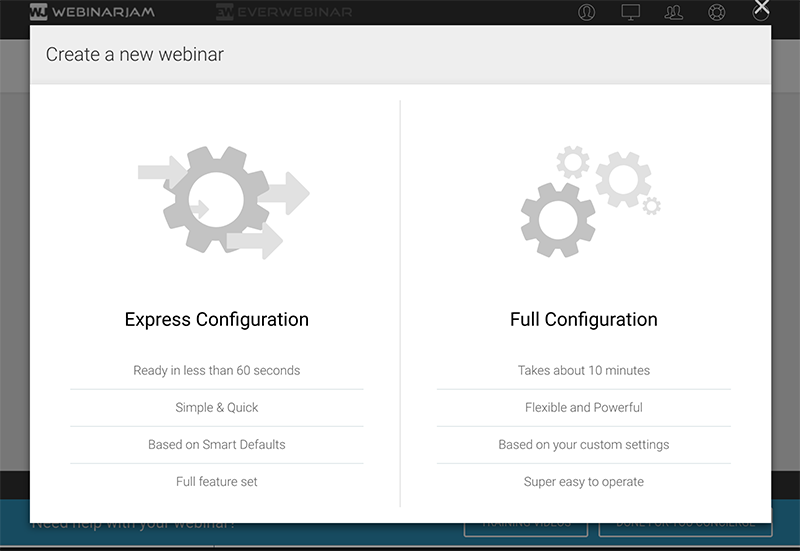 The webinar provider can be either Youtube Live or can be Webinarjam's own private server to stream the webinar. Once you provide this, it's now onto configuring the webinar schedules. You have a variety of options to create recurring webinars or one time webinars that are not to be repeated. Next is the registration pages. You're able to pick from a variety of registration pages and use the webinar to capture leads into your favorite autoresponder. You also have the ability to sort the conversion percentage of the landing pages so you'll know which page templates have a higher conversion. 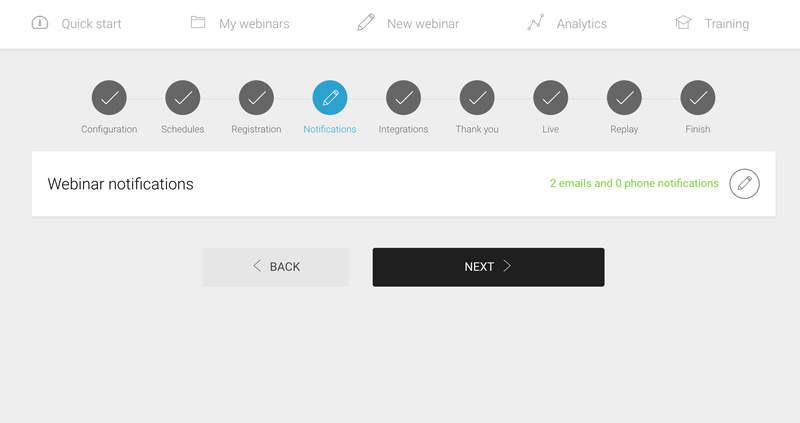 In the next screen you setup your notifications for the webinar. Getting people to register is your first order of business. Getting them to attend and consume your content is the next goal. One of the key fundamentals to doing this is setting up the proper notifications. 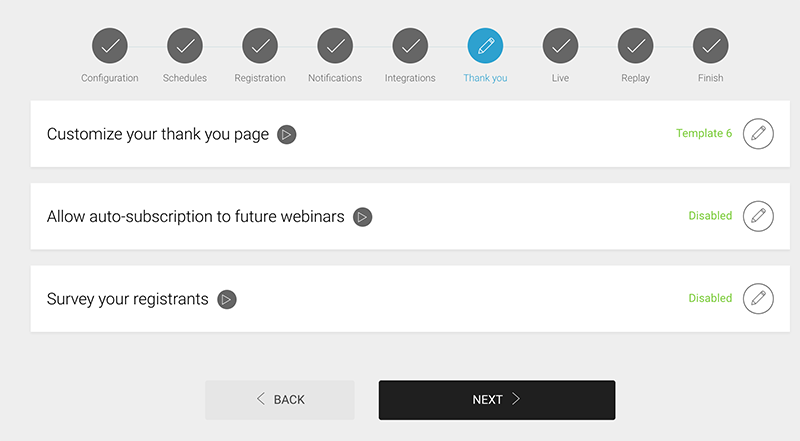 Webinarjam has done an excellent job to provide multiple options for notifications including email and phone notifications 1 day and as little as 30 minutes before the webinar starts giving you multiple notification options for following up before and after the webinar is over. Next let's look at the Integrations Tab. This is pretty self explanatory as you'll select your Tracking and Email Autoresponder integration so that when you begin getting registrants, you'll have them automatically added to your email autoresponder service. The tracking is for those of you that are tracking sales or if you're using retargeting with Facebook or Google. Let's now look at the Thank You page settings. Next, we have the live screen. This is where you'll customize all of the options when you're ready to go live. As you can see you have the ability to run polls, have offers, inject videos, and even file sharing. 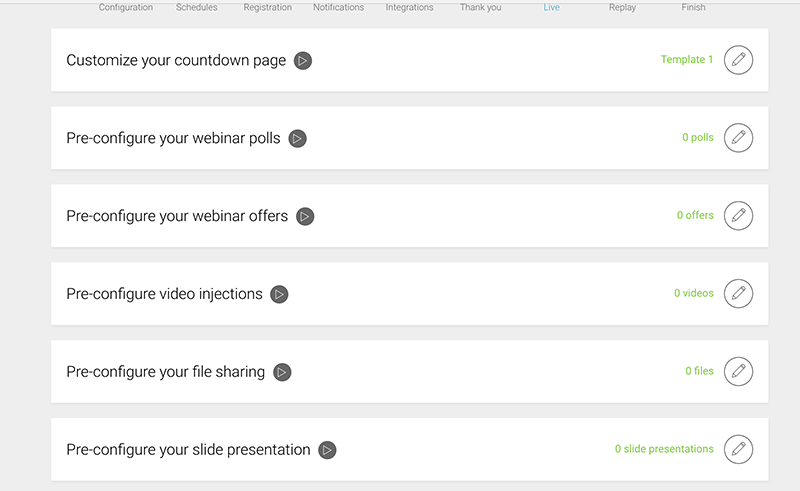 Using Webinarjam's replay page option will allow you to convert your live webinar automatically into a replay. The majority of your money made will come from these replay pages. All you have to do at this point is grab the link and begin promoting your webinar. One of the biggest questions we've gotten is - what's the difference in Webinarjam and Everwebinar? Webinarjam is the software to conduct live webinars. 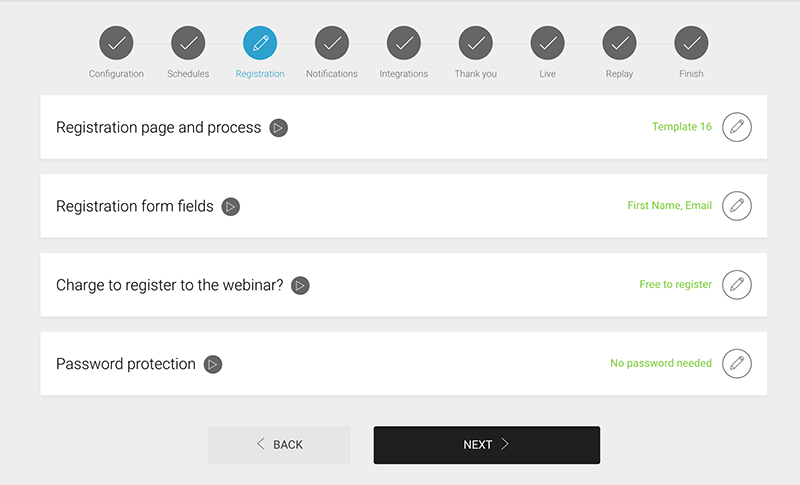 Everwebinar, on the other hand allows you to create evergreen webinars that you can run without physically attending the webinar. The cool part is both of these software products work with each other, which means that when you conduct a successful live training webinar with Webinarjam, you can transfer it over automatically and easily in Everwebinar. We did a review for Everwebinar you can see here for more information. The trial pricing will be expiring very soon. However, if you take action today, you can get the full version of Webinarjam for just $1 for a full 60 Days then rebills at the discounted rate of just $479 per year. So, be sure you take action right away by activating your free trial here.